Announcing our 2012 Pi Day Celebration where you can explore this never-ending number (3.14159 . . .) and Einstein's birthday as well. Visit us in Second Life at Exploratorium Island and its sister-island,'Sploland, on March 14. From 7:00 to 9:00 PM SLT (which is the same as PST), we'll have live music, featuring Cypress Rosewood and others. Play with pi exhibits on Pi Day and throughout the month of March. Visit our Pi Day website for info about Pi Day events at the Exploratorium in real life. Share your images and machinima from Exploratorium Island and Sploland in Second Life with our Flickr group. some of the exhibits on Exploratorium Island and Sploland. Learn more about eclipses through exhibits in Second Life that show the sun-earth-moon system to scale. 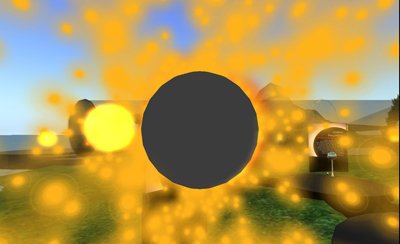 Understand how eclipses happen the Second Life way, by placing your avatar into the exhibit. Share your comments about watching the eclipse in SL. Put yourself into an eclipse! Here, a Second Life avatar puts her head into the umbra—the part of the moon’s shadow that excludes all the sun’s light—in this model of the earth, moon, and the sun during a total solar eclipse. Destination Mars - A Meteor Impact Simulation on the Surface of Mars. Experience a scale model of a Martian asteroid impact. The model crater is 50 m in diameter and the model runs in slow motion at 1/10th the speed of an actual event. Watch a machinima* of the Destination Mars simulation. *machinimas are films made entirely in virtual worlds. Is water ice present or absent in a crater near the moon's south pole? 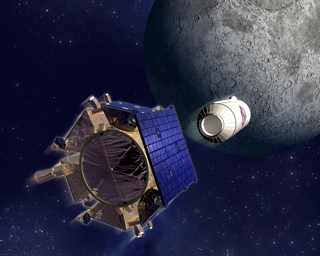 NASA’s Lunar CRater Observing and Sensing Satellite (LCROSS) mission sought a definitive answer. In October 2009, our team broadcast live from the 36" Refractor Telescope at Lick Observatory on Mt. Hamilton, watching the impact and investigating how this intentional crash revealed the existence of water ice. You can also watch a replay of this Webcast on Exploratorium TV! What can a museum do in a virtual world that would be difficult—or impossible—to do in the real world? 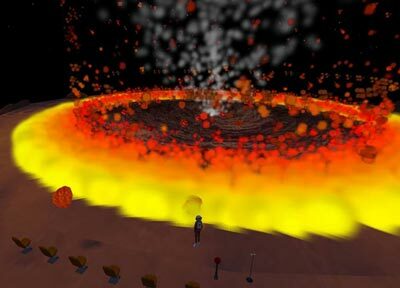 Exploratorium media creators and educators have been exploring this question by experimenting in Second Life (SL), a large, multiuser, three-dimensional online virtual world. You visit this world as an “avatar” (a representation of yourself), and through your avatar’s eyes explore areas and features made by other people or by institutions, or create new environments—or parts of them—yourself. Social interaction is one of the most important features of SL; you can use instant messaging, gestures, or chats to communicate with others. You can also have experiences that are impossible in the real world—from flying anywhere in SL to soaring through the solar system to altering gravity. What you do depends on your curiosity and creativity, which makes it a perfect playground for the Exploratorium. Since early 2006, our staff has been exploring the possibilities provided by Second Life—and has done some amazing things. 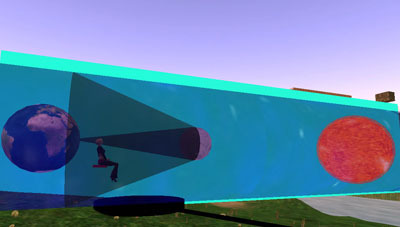 On March 29, 2006, we mixed real- and virtual-world experiences when we presented a live Webcast of our solar eclipse coverage from Side, Turkey, in three virtual SL amphitheaters. 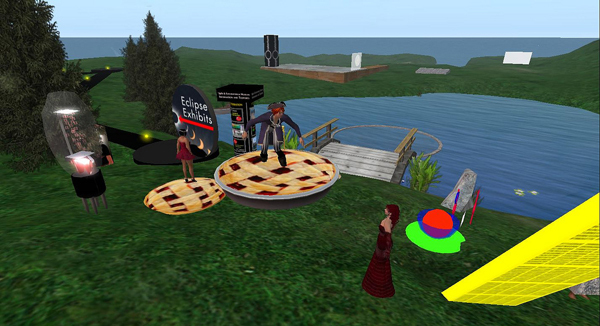 Our eclipse program was also shown on the Web and at the museum, but the experience was different in Second Life. People from around the world, represented by their avatars, gathered at the amphitheaters and shared the unique experience by chatting with each other and with Exploratorium (avatar) staff. In another mix of real and virtual reality, we streamed an entire rare transit of the planet Mercury live from telescopes at the National Optical Astronomy Observatory (NOAO) in Kitt Peak, Arizona, into the International Spaceflight Museum site in SL. Exploratorium staff members provided voice commentary, and an avatar staff member on stage answered questions posed by avatars in the international audience. A three-dimensional model of the orbit of Mercury hung over the stage; avatars could fly to and examine the orbiting planet. In the future, we plan to do a lot more in this online world. Exploratorium Island in SL has a growing number of interactive exhibits, many of which would be impossible to create on the floor of our real museum in San Francisco. We put on public events periodically on the island, and at other locations in SL, and also use the island for exhibit prototyping and for professional development workshops for interactive Web developers, museum professionals, and educators. Sploland, an island adjacent to Exploratorium island, offers fun and provocative exhibits in the spirit of the Exploratorium. Check out both spaces and remember that you can easily fly or teleport between them! We’ll continue to experiment and expand the social, contextual, and educational possibilities of SL through more live events, plus offer other features still in the planning stage. To participate in Second Life, go to www.secondlife.com and download and install the software. Second Life is for adults only, so you must be 18 or older to participate. Once you're in-world, a fun first stop is a museum called the ’Splo, which has more than 100 Exploratorium-inspired exhibits. Are you a web developer or museum professional that would like to get some insight into how to use virtual worlds? The Museum Virtual Worlds Web site is the place to find out how museums like the Exploratorium are using virtual worlds like Second Life to prototype and develop exhibits, create public outreach events, conduct professional development trainings, and to collaborate with other institutions and organizations. the Gordon and Betty Moore Foundation.